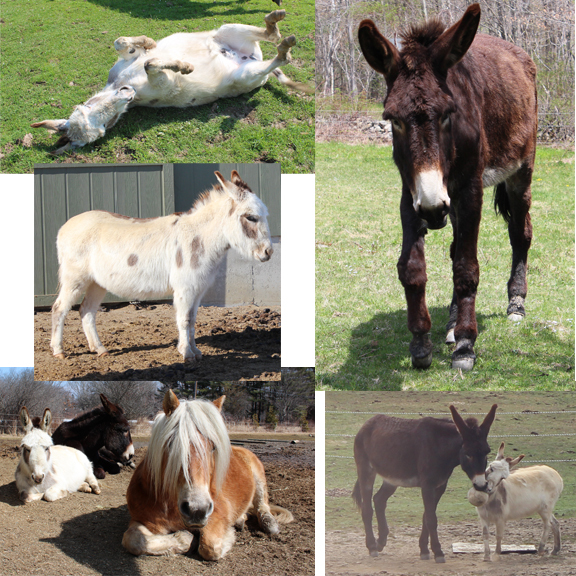 The issue of whether or not donkeys are stubborn has been explored in books and online. Basically they have reasons for the things they do and don’t do, so technically they aren’t stubborn. BUT… when you are living with a donkey it is hard to resist the urge to think, “This animal is stubborn!” I have experienced that often it is the impeccable memory of the donkey that leads to them to act “stubborn”. I am working on overcoming my exasperation with my donkeys by really carefully listening to them when we work together. Asking the donkeys, “What are you noticing? What is different? What are you expecting?” For example, Ichabod will not be lead on my left side. He insists, “That is not how I do it.” In other words when he was trained to lead he remembered the details, such as the side his trainer was on and he wants to stick with the rules! A few days ago I had a great clicker training session with Ichabod. Toward the end I wanted to work on a new trick. I dropped the lead rope on the ground to free my hands. He dropped his nose to the rope, then looked at me. This was not what I was asking him to do. But then… he reminded me that I had taught him to touch ropes on the ground with his nose. (It is a good “safety” trick in case a rider drops the reins.) Of course I rewarded his good memory then asked him to continue our other lesson. He kept putting his head down to the rope, ignoring my “new” topic. I realized at that point he wasn’t being stubborn, he was just sticking with his topic instead of mine. In such an instance my horse would have easily moved on, but my donkey was not going to move on. Easily fixed by moving the rope! Part of the issue with me and the donkeys is that I am not the best clicker trainer. I try and I am OK, but donkeys are very specific, have impeccable memories, and get very attached to things being a certain way. I must constantly look at my own behavior and ask myself, “Are you being consistent?” They also come with memories from before I met them, so I need to be listening and understanding their beliefs about how training “should” be. Another thing that has really helped me relax about donkeys, is to stop being attached to them doing what I want. (Of course safe behaviors are still essential.) I find when I love them, enjoy their company, and stay unattached, we all have a nicer time.